I know they had the Superpumper, and the Tender with the Satillate, when were the disbanded? July 1, 1975 was the termination date for the Super-pumper. Atlas can you verify the termination date. Was that the day that the Superpumper was changed from a stand alone unit to a company mannned by E207? There is mention of the Superpumper working at the Holban Yard 5th alarm in queens in 1980 and I beleive there were some other fires in the 80's. I believe it was sometime in the mid 80's when the Maxi Water system replaced the superpumper. **** UPDATED INFO - July 1, 1975 was one of the days when fire units were disbanded. The Supper Pumper & Tender remained but their manpower was taken away the apparatus was crossed-manned by the crew from Engine 207. Organized on Oct. 1, 1965 at the quarters of E-211 the unit moved to E-207's on April 12, 1972 to the new quarters on Tillary St. which had opened the previous December. In 1979, FDNY received the first six of the 2000 gpm pumpers. They were assigned to Engine's 9 - 72 - 163 - 207 - 330 - 324. The pumper that was assigned to E-163 was reassigned to E-159 shortly thereafter. On Feb. 20, 1982 the Super-pumper worked at its last fire - 77-44-772 @ 17 Grove St. Their last response was on April 24, 1982 to 66-22-377 located @ Morton & West Sts, in Lower Manhattan. Maxi Water was organized on Oct. 25, 1982 & disbanded on Dec. 29, 1998. On that December date Satellite # 6 came in service at E-207. Now ever, Maxie Water had been around since 1982, it was officially placed in service on January 1, 1984 replacing the Super pumper system. Now for the possible reason for the official delay. Members of the Super-pumper Unit, if I am correct, were receiving additional pay yearly. 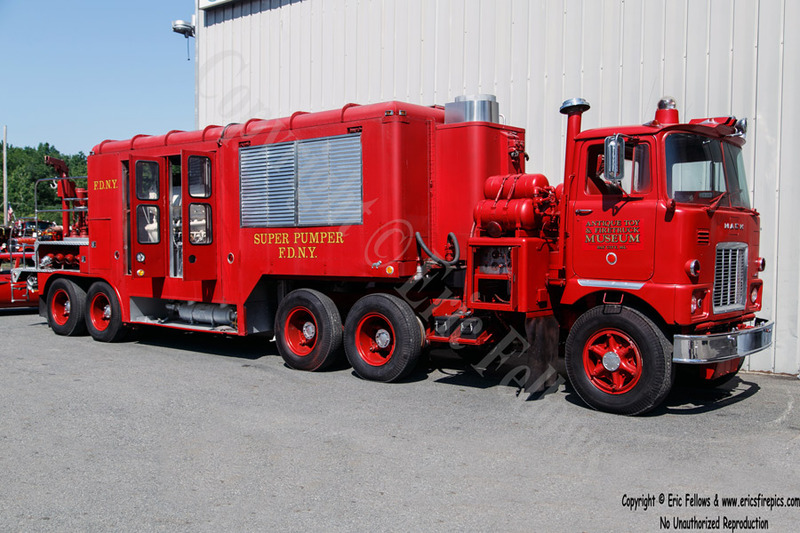 FDNY had to wait until the last member of the Super-pumper Unit had retired before announcing the establishment of the Maxie Water. If not all the new members could have received the additional pay. I'm not sure when or where the picture was taken but take a look. I beleive this is from a museum in Michigan. May be wrong won't be the first time. I wonder if it can still run? Thanks R1 for posting this. I think they are the BEST Pictures I've seen. For me, it's a collectors item. Saw the Super Pumper in operation at a 5th alarm on Washington Ave in Brooklyn at the ABC Lumber yard around 1966 (give or take). Building was a 2 story lumber yard. Super pumper hooked up to hydrants on Atlantic Ave and lines were stretched to Satellite units positioned on the Exposure 1 & 2 corner and the Exposure 1 & 4 corner. Water was started and the monitors criss-crossed their streams. Result....no more second story. I remember hearing the dispatchers telling the Super Pumper that "your hook up site for the ### alarm is at (street location). I believe then the pumper would drop the large suction actually into the water main and draft the water directly from there. I remember the operator wearing ear protection during this operation. As I remember, the Super Pumper would be assigned to Third Alarms thoughout the city and on certain boxes for Second Alarms. And in those days, if you had a Third Alarm, it was a huge fire. An entire cocklot in a row of Brooklyn frames would probably go to a Second Alarm then. (I remember catching one the first time I buffed Bushwick in 1976 on Evergreen Ave). Prior to turning out, the Super Pumper officer would consult water main maps they had in a large cabinet in quarters. He would determine the location of the largest water main in proximity to the fire location and announce that hook up site to the dispatcher upon turn out.